1. To clean Makeup Brushes - The product is made to cleanse & soften 'real baby hair' ( ahem..I know what you're thinking...then what's 'fake baby hair'?!) so needless to say, its going to work wonders on makeup brush hair. This makes cleaning them, a breeze! 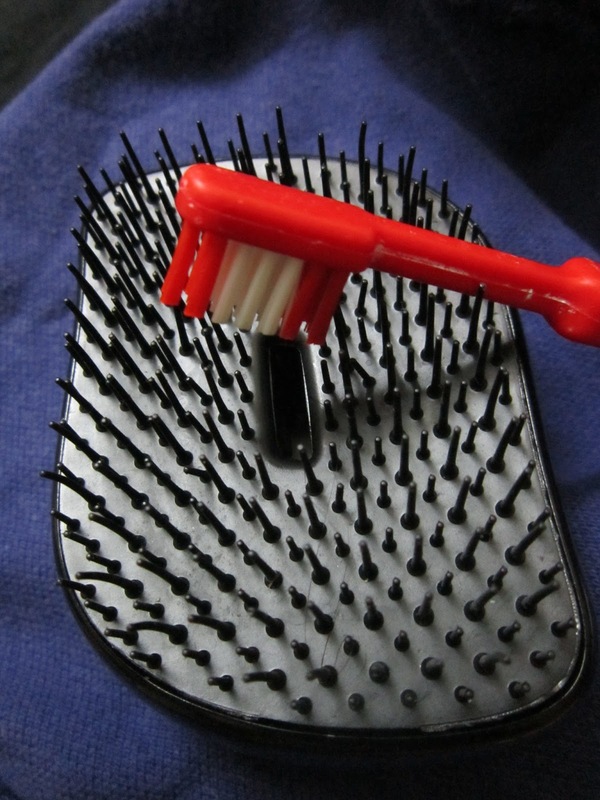 It cleans away all the makeup accumulated within the bristles/hair & conditions them at the same time. Maybe I don't own as many, but I can double-cleanse all my brushes in 15 mins flat!! 2. To clean a Tangle Teezer - This lil product is a miracle in itself, but then keeping this clean is very important. The dust on our hair & dirt/grime that may have formed on the scalp can accumulate on the Tangle Teezer over a period of time. 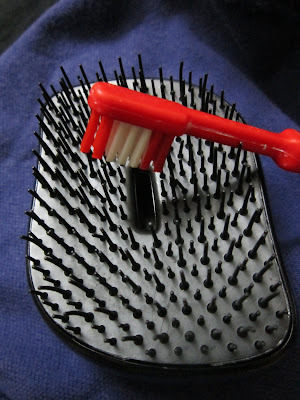 Its tricky cleaning this comb, due to the placement of the teeth; some are shorter, the others long & are placed in a crisscross fashion on the comb. I use the a Baby Shampoo on an old toothbrush and scrub through the TT. Once its thoroughly cleaned, I cleanse it with normal running water, shake off the excess water and leave it to dry. Voila! A 'clean as new' Tangle Teezer is waiting to untangle those knots in your hair, in a jiffy! 1. As a dry shampoo - Let's face it! Mom or not, everyone's busy now a days. There are times when we have to step out without a hair bath, with 3rd or maybe 4th day hair (Come on now..own up! we've all been there some time!). For those slightly greasy hair days, shake out some baby powder (use a finely milled one!) on to your hand, rub it gently between your palms & massage it into the roots of your hair. Pay special attention to the greasy, slightly oily looking areas! I will admit this process is a little tricky since you'll need to know how much powder to take out, because excess might just end up giving you grey looking, dry hair...so try this at home sometime before you try doing this for a day/night out. 2. To mattify a creamy lipstick - We all have that one gorgeous creamy lipstick, that we wish, came in a matte finish. 'Fikar not' my friends, after you've applied the lipstick, hold one ply of a dry tissue paper as a cover on your lips & dab some baby powder from the outside - Instant Matte Effect!! 1. As a makeup remover - On days when you feel tired or down right lazy, a bi-phase makeup remover on a cotton swab can be your saviour! On days when you have some time or you feel your skin need some pampering, try removing your makeup with baby oil. I must say not only does the makeup melt off easily, it also leaves your skin - soft, smooth and moisturized. Do not forget to give it a quick cleanse with baby soap or any other gentle cleanser so that you get rid of any oily residue on your face. How about you? Do you have any products that you love to multitask with? Share them with me in the comments section below. Read my other multitasking experiment with makeup HERE. Editor's note: I am not a Cosmetologist or a Professional makeup artist. I just wish to share makeup & skincare tips via this blog. Kindly use your own discretion when any using any makeup/skincare products. No one knows your skin, like you do!